The invention of the upward-acting garage door in 1921 by C. G. Johnson came with a lot of questions for the modern world. This was definitely an amazing invention that society received with open arms. Today, 63% of homes in the United States have garages. This is according to a 2015 American Housing Survey. Speaking of the questions, many of them still go unanswered today. Mostly for the home owners with garages equipped with this invention. Some of us are new to this, others aren’t so much. But we all have questions. We are going to answer your questions here. By “we”, we mean professional garage door technicians working with Dave Moseley The Door Guy who has been servicing Berlin, NJ for many years. Who is Dave Moseley The Door Guy? 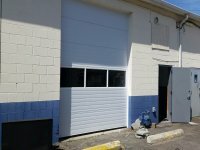 This is a Garage Door servicing companies that specializes in Garage door repair, Garage door installation and all forms of Garage door maintenance services. We have been servicing the Berlin area in New Jersey for many years, and recently expanded to Marlton, NJ. Yes, it’s as simple as it sounds. 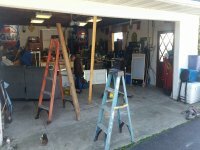 We repair garage door. When yours develops a fault, and you call us, we respond immediately. Then we proceed to assess the situation and pinpoint the problem areas. We give you a free estimate and tell you how we can help you. For instance, garage door spring repair. With the necessary tools, replacements parts and skills, we solve your problems in no time, so you can bounce back to your regular daily schedule. You don’t need to wait for break downs and malfunctions before you have your equipment and machines looked at. That is the whole point behind excellent maintenance culture. Have your technician look at your door from time to time, maybe once every 6 months or one year. That way you avoid situations when a break down will cost you lots of money and waste your time. 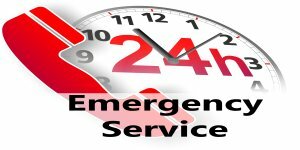 We handle this for you for the lowest cost possible in New Jersey. In situations that call for removal, replacement, and disposal of old garage doors, we have you covered. Also, installation plays right into our area of specialization. We can install new doors for you when you need it. So, call us when you need Garage door spring replacement, garage door opener installation, etc., for example. Q: Why won’t my garage door open? Sometimes the door might just be locked. Q: Should you replace both garage door springs at the same time? A: Yes, you definitely have to. If your door works with two springs pulling the door up, you have to change them together. Even if only one is bad. This is because it is only going to be a matter of time before the one you didn’t change will break. Q: What should it cost to replace a garage door spring? 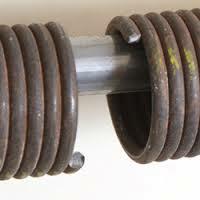 A: Normally, a torsion spring costs between $40 and $100. While an extension spring is cheaper at $5 to $30. A professional will work on this for you in the range of $200 – $300. Q: How much does it cost to fix a garage door? A: This will depend on a lot of factors. Like, what is damaged, what needs to be replaced, how many hours of work have to be put in, etc. But on an average, the cost to fix your garage door goes from $100 to $300. Q: Why did my garage door stop working? A: We answered this in the first question. The most likely problem in this situation, however, always relates to power. If your garage door opener is not connected to a power supply, it will not work. Sometimes your garage door may be connected but it still doesn’t work. In this situation, your garage door opener is faulty. Most probably the cause will be an internal electrical issue with the opener. If you want to work on this by yourself, you will need to use a multi-meter to check the internal parts of the opener for which component is responsible for the malfunction. Q: Why won’t my garage door seal at the top? A: This could be caused by loose screws in the lift bar. Your garage door needs some adjustment. Your rollers may need to be checked and adjusted too. Q: Why does my garage door open before closing? A: Your garage door has limit switches. These are used to tell the garage door motor to stop working when it is closing or opening. It is what makes it to stop moving when the limit has been reached. This is also the reason why your door opens before closing, and it will look like a malfunction. Also, it could be a safety feature that prevents the door from hitting someone if they are close to the door. If you reset the limit switch, it could solve the problem. 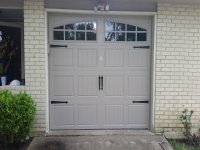 Q: Why is my garage door reverse not working? A: Most probably the circuit board is bad and needs replacement for the reversing sensor to work. Q: Can the cold weather cause problems with my garage door? A: Yes, in cold weathers, metallic parts may be affected. For your garage door, your springs may become brittle and break easily in cold weather. Call an experienced garage door technician to help you with this. Q: Why does my garage door only close when holding button? A: This could be because the sensors are bad. It is either the path to the sensors is blocked or the sensor is malfunctioning. To solve this problem, clean the sensors, align the eyes and correct any loose wires in the sensors or motor head.